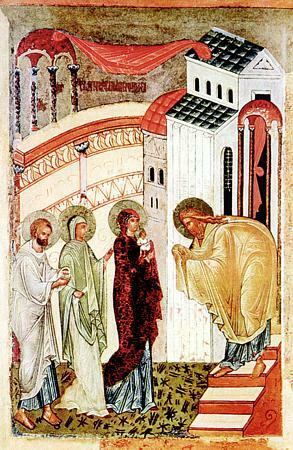 On Saturday, February 15 the Orthodox Church celebrates the Feast of the Presentation of the Lord Jesus at the Temple. A Divine Liturgy will be celebrated in the St.Nicholas home church in Reykjavik at Öldugata 44 at 10.00. The Meeting of the Lord in the Temple (also called the Presentation of Jesus at the Temple) is one of the Great Feasts of the Orthodox Church, celebrated on February 2 and February 15 (which is in fact February 2 according to Julian Calendar). This feast is also known as Candlemas, particularly in Western nations, due to the custom of blessing candles on this day. In Iceland it's named Kyndilmessa (see: http://is.wikipedia.org/wiki/Kyndilmessa). In the Gospel of Luke 2:22-35, Mary and Joseph took the infant Christ to the Temple in Jerusalem. He was received in the arms of the elder Simeon, who then prayed, "Now let Thy servant depart in peace... for I have seen Thy salvation." This was one of the things that Mary "pondered in her heart"- the fact that others recognized that her Son was the Messiah. Rejoice, O Virgin Theotokos, full of grace! From you shone the Sun of Righteousness, Christ our God. Enlightening those who sat in darkness! Rejoice, and be glad, O righteous elder; You accepted in your arms the Redeemer of our souls, Who grants us the Resurrection. By Your nativity, You did sanctify the Virgin's womb, And did bless Simeon's hands, O Christ God. Now You have come and saved us through love. Grant peace to all Orthodox Christians, O only Lover of man!